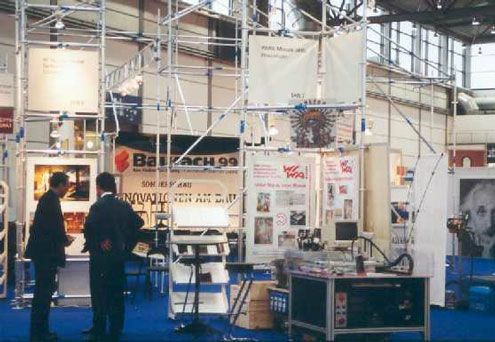 the team Arno A. Evers FAIR-PR thanks you for your participation in the special exhibition INNOVATION ON THE BUILDING SITE. Economic building requires the readiness new ways to go. 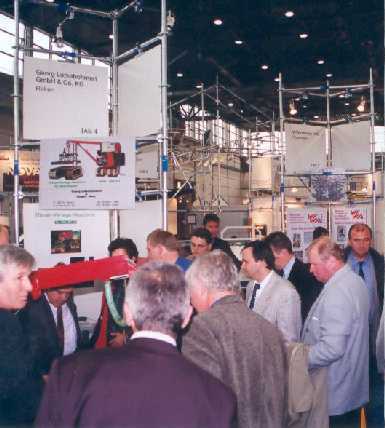 The special exhibition INNOVATION ON THE BUILDING SITE showed ideas, solutions and strategies for future building. Economical and nevertheless quality-conscious building is possible only with consideration of all phases of building from the prefabrication to the reorganization. 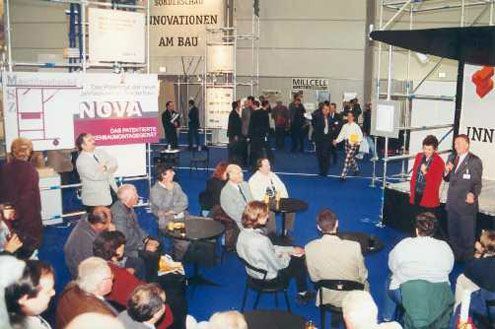 The special exhibition INNOVATION ON THE BUILDING SITE - the optimal platform for your ideas, solutions and strategies. Here a singular Synergyeeffect was offered, because you as exhibitors presented yourselves jointly. The focal point was the central topic: INNOVATION ON THE BUILDING SITE! The innovative design of our joint presentation allows one view on three exhibitors at the forum. 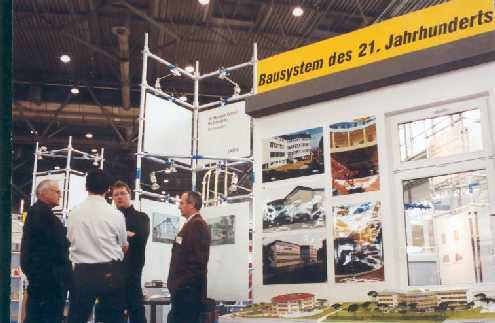 The exhibitor W. Nusser GmbH talks to an interested audience about "The Building System of the 21st century". 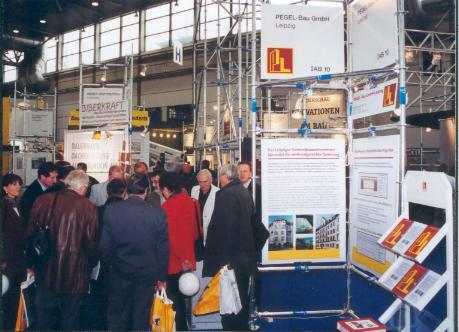 Always a lot of visitors payed attention to the new concept of laying tiles. This company showed a new concept for the renovation of floors in buildings from 1890 to 1930. 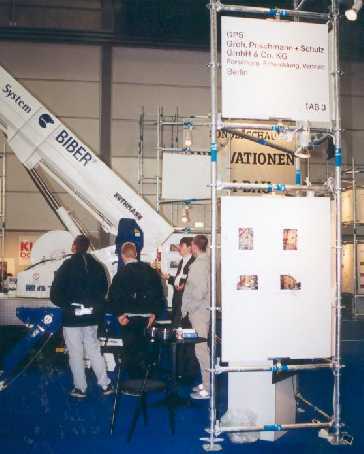 The System BIBER demonstrated at their booth how the new innovation to clean old fassades works. 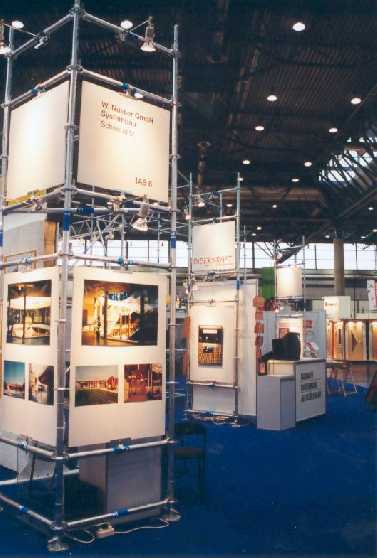 Evening-Impressions of the individual Stand-Design at the joint exhibition. 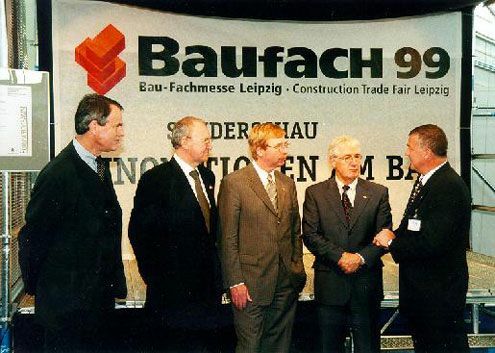 Conception, organization and implementing of the community status on the building trade fair Leipzig were executed for the second time by Arno A. Evers FAIR PR. Again large success is substantial part of your very good co-operation and your commitment. Thank you! Hereby we thank the Leipziger Messe GmbH, in particular the PL1-Team, Mrs. Ingrid Heineck and Mr. Michael Kynast.